For years, the Fiber Guild met at Nancy J. 's house for its December meeting. Many times, members would bring a wrapped skein of yarn for a gift exchange. Often Nancy would organize some musical entertainment. One year, several of the Riverton ladies performed attempted to perform Christmas carols accompanied with Boom Whackers; another year, one of Nancy's piano students entertained the members. Santa even showed up one year with treats for those in attendance. Refreshments often included mulled cider, an egg casserole, and Julie W.'s famous cranberry coffee cake. 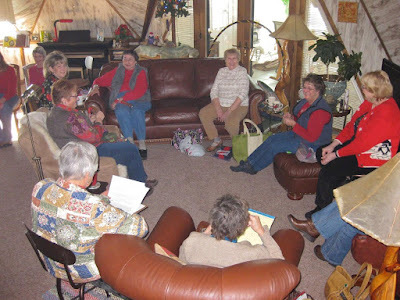 Gradually, the group outgrew Nancy's house, and we met in larger venues. To give you an idea of what Boom Whackers sound like, here's a video for your enjoyment. The Riverton ladies had a lot of fun playing the Boom Whackers, but we spent more time laughing than actually playing. I had never heard of Boom Whackers until this post. Thank you for sharing the video. I enjoyed it immensely. I'm so impressed with the music these young people were able to produce with something so simple. I wonder if their legs burn after the concert? Amazing. Good times!!! I miss my old knitting group. Like all the others I had never heard of Boom Whackers either:) What wonderful memories. I, too, had never heard of the Boom Whackers! Fun times!! What a fun group that must have been. I had never heard of the Boom Whackers. Funny! Fun times. So do you still have boom whackers? I must admit I’ve never heard of them. I had never heard of Boomwhackers. I could see how that could easily get out of hand with laughing. But, they DO sound pretty good. cranberry coffee cake? yes please!! Happy memories for you. The Boom Whackers look like a lot of fun. Never heard of a Boom Whacker, but cranberry coffee cake? oh yess!!! I have not been knitting with groups lately. I am of two minds about it. Fun post! I still miss Nancy K! Awwww! I miss getting together with my spinning group and knitting group. It sure sounds like you enjoyed your gatherings!! !